One of the important mechanisms in driving safety is the braking system. Not only serves to keep the driver safe but also the people around the road. In general, because the brakes are mechanical devices and become vital components, it also needs regular and periodic maintenance. Daily detection helps reduce the risk of accidents caused by loss of brake performance. Moreover, often through traffic density, the intensity of its use is certainly much improved. Therefore, care and examination periodically and simply can be done every day. Here is a brief tips one of the mechanics of Indomakmur car workshop located in Cimanggis, Depok, in taking care of the brakes on private vehicles. 1. For the latest standard output car is equipped with an indicator of the level of reasonableness of oil or brake fluid. However, the effects of the braking system can be done manually. The trick, just take a few meters, either forward or backward and then stepped on the brake pedal. If it is convincing, you can immediately step on the gas. 2. In order to maintain optimum braking performance, there is good when washing the car choose a more professional wash. Usually, the places are more detailed when washing the deepest parts, such as rims, discs, and brake pad holder. 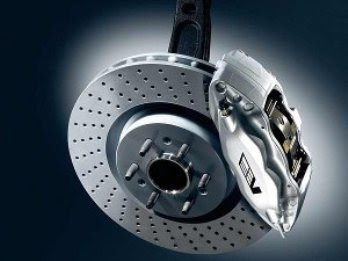 If the discs and brakes are always clean of dirt, then braking performance is automatically maintained well. 3. While the treatment is more detailed, for example for brake pad components. It is recommended per 10,000 kilometers to check and clean the inside. For this, it can lead to a professional or official workshop for dust or dirt cleaning services, including on canvas, drum, and discs. If dust or dirt is rarely cleaned it will cause a scratch effect on the disc or brake pad. 4. For hydraulic braking system, routine inspection is recommended at least every vehicle has traveled 40,000 kilometers. 5. Then when the component replacement process. You can know the indication when driving, that is when the braking occurs more vibration than usual when the brakes. Also, the brake pedal is deeper than usual and there is a squeaking sound when stepping on the brakes. When all these factors appear, then it is time to do the replacement of components such as master, canvas, or break pad. Braking system itself is divided into two, namely Non ABS and is equipped with ABS feature (anti-lock brake system). ABS is a brake technology that avoids locking the brakes when braking is done at once. While non ABS otherwise. For non ABS brake system, it is recommended to braking gradually or shuffled in fast vehicle condition, in order to avoid overheating during pegereman. Because, if the brakes to be locked then the effect of the vehicle can not be controlled, where when the steering wheel is turned to the left of the car will instead to the right and vice versa. So, do not underestimate the braking system in the vehicle. Because, braking performance is crucial not only to your safety but also to other riders or people around.